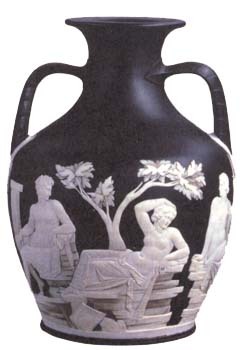 Wedgwood Pottery – The Wedgwood tradition has always been embodied with experimentation, innovation and quality. Founded in 1759 by Josiah Wedgwood, the company continues to be one of the world’s leading pottery brands, now incorporating other famous names such as Coalport and Masons Ironstone. ‘Images by courtesy of the Wedgwood Museum Trust Limited, Barlaston, Staffordshire’. Born in 1730 in Burslem, Staffordshire, Josiah Wedgwood was the youngest of twelve children. He was born into the pot-making family of Thomas and Mary Wedgwood of the Churchyard Pottery, Burslem. He is often reffered to as the Father of English Potters due to his innovation and the impact he had on the pottery industry. His delicate cream coloured earthenware, inspired by porcelain from China, was light but durable, with a clear and brilliant glaze. Queen Charlotte in 1765 ordered a teaset to be made of it, and by Royal Consent permitted her name to ever after be associated with it, Queen’s Ware. This new creamware was so superior to all other earthenwares available it led to changes in the pottery industry all over Europe. Other innovations included Black Basalt used for relief plaques, busts, medallions and cameos, and the striking Jasperware (see picture left), for which Wedgwood is world famous, often adorned with Greek and Roman style bas-reliefs. Josiah served his apprenticeship as a potter, and was taken into partnership in 1754 by Thomas Whieldon of Fenton, the greatest English potter of his time. Five years later, in 1759, Josiah set up in business on his own account. 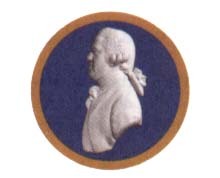 The Wedgwood tradition was continued by John Wedgwood introducing a version of the popular blue and white china being produced ‘Bamboo’ and the famed ‘Blue Rose Border’, the second Josiah Wedgwood, and into the early 20th Century with concepts such as the colourful Fairytale Lustre, and today with the current Lord Wedgwood of Baralaston. He was a supporter of the American War of Independence, and worked against the slave trade. As a businessman he was quick to realise items could be made to commemorate and show particular events. Jasperware proved very useful for this and Wedgwood and continue to make event piece s to this day. One famous earlier piece produced in 1787 was a medallion depicting an African slave, bearing the motto ‘Am I not a man and a brother?’. 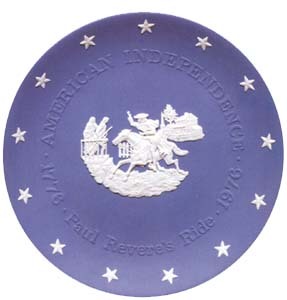 Pictured right is a Paul Revere plate celebrating the 200th Anniversary of American Independence. Pictured left is the initial joining gift of a Pair of “Life and Works of Wedgwood” Miniature Plates from the launch The Wedgwood International Society. The Society ran for several years and is now closed. Visitors are able to visit the Wedgwood Visitors Centre sited at the main Wedgwood factory on the outskirts of Stoke-on-Trent in the English Midlands. The centre includes exhibitions and demonstrations.